New Burger Records Limited Edition T-Shirt! 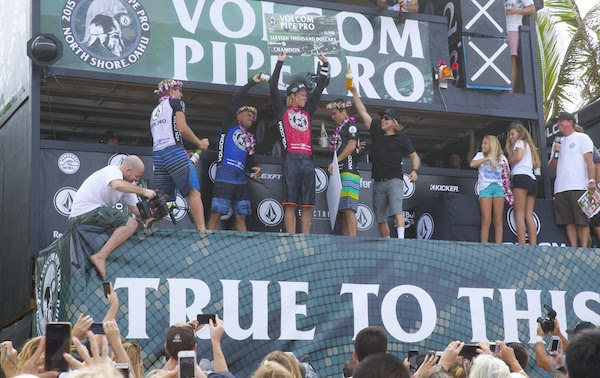 PIPELINE, Oahu/Hawaii (Monday, February 2, 2015): JOHN JOHN FLORENCE has won his fourth Volcom Pipe Pro title in five years, defeating MASON HO (HAW), KELLY SLATER (USA), and SEBASTIAN ZIETZ (HAW) in highly technical, 6-to-8 foot Backdoor. Slater is the only surfer to have interrupted John's streak, winning here last year. The Volcom Pipe Pro is a WSL QS3000 event and the first competitive appearance of all four finalists in the League's 2015 season. Florence, 22, had the 35-minute Final in the bag within the first seven minutes, posting wave scores of 9.2 and 8.43 for the highest heat score of the entire event -- 17.63 out of 20. Florence and Slater, 42, had been the pair to beat here from the outset, pushing each other round for round and flip-flopping on highest wave and heat scores along the way. A whipping 25mph side-offshore wind helped keep the Backdoor barrels and aerial opportunities open, but presented major challenges in the form of wave face chop. Ho drew first blood in the final with a beautiful barrel for 8.6 points, but his dreams fell apart the minute Florence hit his stride. Florence seemed to read the conditions and rising swell lines with ease, tapping into his lifetime of local knowledge to leave his challengers chasing him. By the end of the heat, Slater found himself in a rare combination situation, needing two much higher scores than any he was carrying to catch Florence. Zietz met a similar end. Ho found one last tube, but fell short of the win with a 7.3. "This-morning it was really fun, the wind was pretty clean and just really long, little barrels," said Florence. "Then the wind picked up and started putting this chop in it and it made it really, really difficult out there. But it was so fun. It was just whoever was in the spot for the good double ups. "Getting two scores in the beginning of a heat that's 35 minutes long, you sit for so long... like, oh my God, I've got 20 minutes here to just think about it (laughs)! "Going into the this year it's going to be a fun one. I come in with a lot of confidence out of last year, knowing I can make the heats and do really good. I'm just going to go into this year thinking the same kind of thing and hopefully it comes down to the end of the year out here at Pipe. It would be awesome. That's my dream come true - to win a world title out here at Pipe. I couldn't ask for anything more." Slater posted the only perfect 10 of the event in this-morning's Quarter Final for a super long, deep and weaving barrel ride. It earned him the "Electric Perfect 10" Award of the competition. He also won the inaugural Todd Chesser Hard Charger Sportsmanship Award, in honor of a much-loved North Shore big wave rider who passed away charging big waves on Feb. 13, 1997. "Todd was one of my great friends, we were all devastated by his passing," said Slater. "What Todd meant to us was he exemplified a guy who was totally fit and driven to charge and go surf big waves all the time. He pushed all of us. Todd's pretty much a part of our every day life still. We have a get together every Thanksgiving for him, there's probably not a week that goes by that we somehow don't have a conversation about Todd and it's been 18 years since he passed away." As members of the World Surf League's (WSL) elite Top 34, Florence, Slater and Zietz now turn their attention to the start of the 2015 Samsung Galaxy Championship Tour that gets underway in Australia on February 28. The World Title will be decided in December back here at the Pipe Masters. The World Surf League (WSL) organizes the annual tour of professional surf competitions and broadcasts each event live at WorldSurfLeague.com where you can experience the athleticism, drama and adventure of competitive surfing -- anywhere and anytime it’s on. The WSL sanctions and operates the following tours: the Junior Tour, Longboard Tour, the Qualifying Series (QS), the Big Wave Tour and the crown jewel of the sport, the WSL Championship Tour (CT) which determines the sport's undisputed world champions. The organization is headquartered in Santa Monica, California with Commercial Offices in New York. The offices are supported by regional centers in Africa, Asia, Australasia, Europe, Hawaii, North America and South America. PIPELINE, Oahu/Hawaii (Sunday, February 1, 2015): Freedom from having to prove a thing is 11-time WSL World Champion Kelly Slater's (USA) ultimate weapon, proven with two pace-setting performances at the Volcom Pipe Pro today. In high quality but inconsistent 8-to-10 foot barrels, Slater put on a tube-riding clinic at Backdoor Pipe to post two of the three highest heat scores of the event in Rounds 3 and 4 - 16.2 points and 15.6 points respectively. The only surfer to surpass him was his nextdoor neighbor John John Florence (HAW), who topped the scores at 17.0 in Round 4. Slater, 42, is the defending Volcom Pipe Pro champion but also plays the role of inspiring a new generation of pro surfers - including Florence - that are here to try their hand against the ultimate surfer of their lifetime. While he may be light years removed in terms of career accomplishments and experience, Kelly is right on par with their youthful exuberance and excitement to surf the world's "ultimate playground": Pipeline. Slater advanced from his fourth round heat to the quarter finals today alongside 21-year-old Kaimana Jaquias (HAW) - the son of one of Kelly's good friends and original touring peers, Kaipo Jaquias. "It's cool to surf with Kaimana, I surfed against his dad 20-plus years ago, so to now be surfing against his kid is pretty cool," said Slater. Kelly first stepped foot on the sands of Pipeline at the age of 14 and says he's as excited by the place now as he was on that day. "This is the ultimate playground for me. There's nothing else to me that's nearly as fun as my job. I just love it. I sit on the beach and imagine what I'm going to do when I get out there and I get stoked when I see someone get a great wave. And it's getting more and more like that as I get older and less attached to the results." Twenty-two year-old Florence is at the other end of the spectrum and career line. Touted as one of surfing's greatest natural talents, proving himself is precisely what he's here for. Along with their property fence-line, Florence also shares Slater's passion for Pipe and source of momentum for the year. Just weeks ago they both ended the 2014 season here watching Brazil's Gabriel Medina run away with the world title. "I got a lot of confidence out of the end of last year and Gabe winning the title," said Florence. "It really opened my eyes, like, oh my gosh, I want to do that now! It's really pushing all of us. "Going into 2015, I'm excited, and it's great to start the year here at home in great waves. This event helps get momentum to head into the season." Other top performers today included Ezekiel Lau (HAW), Sebastian Zietz (HAW), CJ Hobgood (USA), Mikey Bruneau (HAW), Masatoshi Ohno (JPN), and Hank Gaskell (HAW). Head to the official 2015 Volcom Pipe Pro website www.VolcomPipePro.com/live to watch LIVE. Image: IAN WALSH (HAW); taking it up a notch with the rising surf heights. PIPELINE, Oahu/Hawaii (Saturday, January 31, 2015): Top seeds took the waves for Round 3 of the VOLCOM PIPE PRO today and conditions kicked up in size and severity throughout the afternoon. Second Reef Pipe began to feather and it was boom or bust, delivering high scores, heavy wipeouts, the occasional injury and a slew of snapped surfboards as wave face heights reached 18 feet. The Volcom Pipe Pro is a $100,000 WSL QS 3000-rated event. Maui's IAN WALSH, 31, a regular at Pipeline and a big wave specialist, featured in a heat of high drama as the swell took a major jump in the early afternoon and became highly dangerous. Walsh was pitted against locals EZEKIEL LAU and EVAN VALIERE, and 17-year-old Italian rookie LEONARDO FIORAVANTI, and all four were pushing the limits. Walsh came through with the highest individual wave score of the competition to that point with a critical drop and deep tube ride for 9.5 points out of a maximum 10. But a different story unfolded for Fioravanti, who took a brutal wipeout after takeoff and was whisked out of the impact zone by Hawaiian Water Patrol. He left the beach in an ambulance with a suspected back injury, putting his 2015 season in jeopardy. "It's really challenging Pipeline today," said Walsh. "There's been a lot of different moods throughout the day. It started really wonky with a short interval swell... and it's not in the defined lineup that we're used to. "It definitely has a danger factor today being that it's compressed onto the inside of the reef and there's not that many good waves, so you do have to roll the dice on waves.. and create your own opportunity. "It's unfortunate that Leo got hurt. I was bummed when I saw him waving his arm (for help). You don't want that to happen to anyone out here and it's so quick to get hurt. Boom! You're on the bottom and a lot of times you don't even know what happened." As the afternoon progressed, the scores began to fly thick and fast. NATHAN FLORENCE (HAW), younger brother of Hawaii's top pro surfer John John Florence, took heat scores up a notch when he posted 14.86 points out of 20. Then the very next heat,MIKEY BRUNEAU (HAW) took it further with the highest scoring tube ride - 9.57, and the highest heat score of the event so far: 15.0. "I just want to get another opportunity to surf out there with only three other guys out," said Bruneau. "I love Pipeline so much. I fell on the wave before (the 9.57) and was kind of shattered. I lost priority and there was one minute left. Then that thing popped up and looked pretty lurchy, but I figured I had to go. It spat me out and I was pretty stoked." Other incredible rides today were logged by IAN GOUVEIA (BRA); JAMIE O'BRIEN(HAW); DUSTY PAYNE (HAW); KIRON JABOUR (HAW); and EVAN GEISELMAN (Fl., USA) - (see VNR highlights). The first seven of 16 Round 3 heats were held today. JOHN JOHN FLORENCE andBRUCE IRONS will headline the opening heat when competition resumes - presumablytomorrow, immediately followed by 11-time WSL World Champion KELLY SLATER. The next call will be at 7am tomorrow. The Volcom Pipe Pro requires three full days of competition and will be held on the best days of waves between now and February 8. BRUCE IRONS: "I WANT TO WIN. THAT'S WHY I'M HERE"
"I WANT TO WIN. THAT'S WHY I'M HERE"
Image: BRUCE IRONS (HAW); when he's on, he's ON, and today was one of those days. PIPELINE, Oahu/Hawaii (Thursday, January 29, 2015): BRUCE IRONS has been behind many monumental tube rides on historic days at the Banzai Pipeline over the past 15 years. He won three events here between 2001 and 2002, including the esteemed Pipe Masters. A win has eluded him ever since. Today, following a magical ride in the opening day of the Volcom Pipe Pro, he declared he's back to win. In excellent 10- to 15-foot barrels, Irons was brilliant, and all it took was one ride. In a special 40-minute Wildcard heat, Irons was one of eight top Pipe chargers battling for a direct berth into Round 3. Best single ride would determine the winner. Among those in the hunt were MAKUAKAI ROTHMAN (HAW), DEREK HO (HAW); and ALEX GRAY (USA). Irons, 35, split a solid peak and elected to go right into the Backdoor section of the wave. Driving fast and hard he positioned himself flawlessly for a deep, gaping tube ride, emerging to cheers and a near-perfect 9-point ride that would stand as the highest scoring ride of the day. "I want to win this contest," Irons declared. "I want to win again out here. I want to win the Pipe Masters. I want to get in the Pipe Masters. I want to win, period, and out here is the place I want to do it. That's why I'm here." For years, the Volcom Pipe Pro has offered an opportunity to local surfers to get a start in the Pipe Masters - the final stop on the WSL Championship Tour that is regarded surfing's ultimate crowning moment. Bruce knows what it takes to get there and after decades invested here, he knows what to do when he does. "Pipeline has been my favorite wave since I was a young kid growing up. Something about this wave is amazing. It's a mesmerizing wave. I love it. "I liked the one-wave format (of the one-off wildcard heat). You're out there with a bunch of friends and you just want to get the best wave. All or nothing. Balls to the wall. I like it." For the remainder of the event, surfers will win or lose based on their top two rides. Expect double brilliance from Bruce. Round 1 and the first 4 of 16 heats that comprise Round 2 were held today before an onshore wind shift brought a halt to competition. Standouts included locals REEF McINTOSH and JAMIE O'BRIEN, along with Brazil's HIZUNOME BETTERO. Top seeds coming up in later rounds include KELLY SLATER (USA), JOHN JOHN FLORENCE (HAW); WIGGOLLY DANTAS (BRA), and MITCH COLEBORN (AUS). Volcom Wildcard Heat Winner: Bruce Irons (HAW) 9.0 top ride. Into Round 3. It's ON! Watch Day One Of The 2015 Volcom Pipe Pro Live! Banzai Pipeline, Oahu, Hawaii (January 29th, 2015): Today is the first day of the waiting period for the 2015 Volcom Pipe Pro and without any delay the contest is ON! Competition begins with Heat 1 of the Round of 112 at 8:00am HST and will be broadcasted live at VolcomPipePro.com/live. Past champions Kelly Slater, John John Florence and Jamie O'Brien are all back to compete in 2015 and we are pleased to announce our two event wildcards, Balaram Stack (Long Island, NY) and Parker Coffin (Santa Barbara, CA). The two young competitors come from far away but have spent many of their winters on the North Shore and have put in their time at the Banzai Pipeline. The one remaining wildcard spot in the event will be decided by the very special and exciting 'Volcom Last Chance Qualifier' heat. The 3rd annual “VLCQ" will be a 40 minute, 8-man heat in which veteran pipe warriors Bruce Irons, Gavin Beschen, Alex Gray, Kawai Lindo, JD Irons, Kaimana Henry, Derek Ho and Makua Rothman will all be contending in a best-wave, winner-take-all battle for a seed into the Round of 64. Surfline.com, the official forecaster of the 2015 Volcom Pipe Pro, is calling for 8-12’+ faces, offering waves at both Pipe and Backdoor with a slow decline through the day. Winds will be calm to light/variable in the morning, with a light+ to moderate SW-West Kona wind rising up in the afternoon. Stay tuned to the official 2015 Volcom Pipe Pro website www.VolcomPipePro.com to watch the live HD webcast of the event, as well as receive up-to-the-minute results, daily recaps, videos, photos and much more! iPhone and iPad users can also download the VolcoMobile App from the iTunes App Store to watch the live webcast and stay alert to the latest 2015 Volcom Pipe Pro news. Image: KELLY SLATER, defending Volcom Pipe Pro champ takes the drop en-route to his 2014 victory. BANZAI PIPELINE, Oahu/Hawaii (Tuesday, January 27, 2015): The holding period for the $100,000 2015 Volcom Pipe Pro, a World Surf League (WSL) QS 3000 rated event, is set to begin this Thursday, January 29th at the world famous Banzai Pipeline. This is the first major event of the WSL Hawaii 2015 season and will be held on the best three days of surf within the designated period. Underscoring the excellent reputation of this event and the quality of surf it typically enjoys, KELLY SLATER (USA), JOHN JOHN FLORENCE (HAW) and DUSTY PAYNE (HAW) will head the 112-man international field from more than a dozen countries. Surfline.com, official forecaster to the event, anticipates solid 8- to 12-foot surf on Thursday that will likely see the event immediately underway at 8am. Stay tuned to the official 2015 Volcom Pipe Pro website www.VolcomPipePro.com to watch the live HD webcast of the event, as well as receive up‐to‐the‐minute results, daily recaps, videos, photos and much more! iPhone and iPad users can also download the VolcoMobile App (http://geni.us/nKa) from the iTunes App Store to watch the live webcast and stay alert to the latest 2015 Volcom Pipe Pro news. Banzai Pipeline, Oahu, Hawaii (January 27th, 2015): For the 3rd year in a row, Volcom will continue to adhere to the guidelines set forth by Sustainable Surf to ensure that the 2015 Volcom Pipe Pro meets the criteria to be certified as a "Deep Blue Surfing Event." Volcom will be addressing and measuring the impacts of the 2015 Volcom Pipe Pro in regards to: Energy, Waste, Community Support, Transportation and Climate Change. For a look back at the efforts taken by Volcom last year at the 2014 Volcom Pipe Pro to not only meet but exceed the requirements in becoming a "Deep Blue Surfing Event" visit Sustainable Surf's recap of the event. Be sure to also watch Volcom Pipe Pro: Sustainable by Design 2014, a film by Nathan Peracciny, that captures the stories behind those efforts. For those lucky enough to be on Oahu for the Volcom Pipe Pro, Volcom will be hosting a follow up to last year's successful Sustainable by Design edition of Talk Story at Surfer the Bar. This year’s Talk Story event will again be hosted by professional athletes, Dave Wassel and Alex Gray, and will feature a screening of the aforementioned Volcom Pipe Pro: Sustainable by Design 2014, presentations by Volcom’s Global Sustainability Director and the Executive Director of Sustainable Coastlines Hawaii, as well as a performance by local reggae act, The Jimmy Weeks Project. The event starts at 8pm sharp on Saturday, January 31st and is free to the public before 8:30pm. For a full run down of Volcom's sustainability initiatives and partnerships with local community organizations at the 2015 Volcom Pipe Pro, please visit the New Future page on Volcompipepro.com. Ready For The 2015 Volcom Pipe Pro!? Watch The New Trailer! Banzai Pipeline, Oahu, Hawaii (January 22nd, 2015): The waiting period for the 2015 Volcom Pipe Pro, a WSL QS 3000 rated event, is set to begin Thursday, January 29th at the World Famous Banzai Pipeline. 112 world-class surfing “Warriors” from all over the globe will be fighting for a $100,000 prize purse and up to 3,000 QS points to kick off their season. To ensure that these Warriors are able to do battle in optimum wave and weather conditions, the competition will only run on the best days within the 11-day waiting period, ending February 8th. This has been a very exciting winter on the North Shore and looking at Surfline.com, the official forecaster of the 2015 Volcom Pipe Pro, we can see that there is still plenty of surf on the way. The Volcom Pipe Pro is always a special event for the local Hawaiian competitors with the contest being held at one of their most treasured surf spots, not to mention it being a gateway event for non-World Tour surfers to compete in the prestigious Pipe Masters. The top 16 Hawaiians from the Volcom Pipe Pro will be sent into the $100,000 Pipe Invitational, which serves as the trials for the Pipe Masters, held on the first day of contestable surf within the event window in December. Stay tuned to the official 2015 Volcom Pipe Pro website www.VolcomPipePro.com to watch the live HD webcast of the event, as well as receive up-to-the-minute results, daily recaps, videos, photos and much more! iPhone and iPad users can also download theVolcoMobile App from the iTunes App Store to watch the live webcast and stay alert to the latest 2015 Volcom Pipe Pro news.